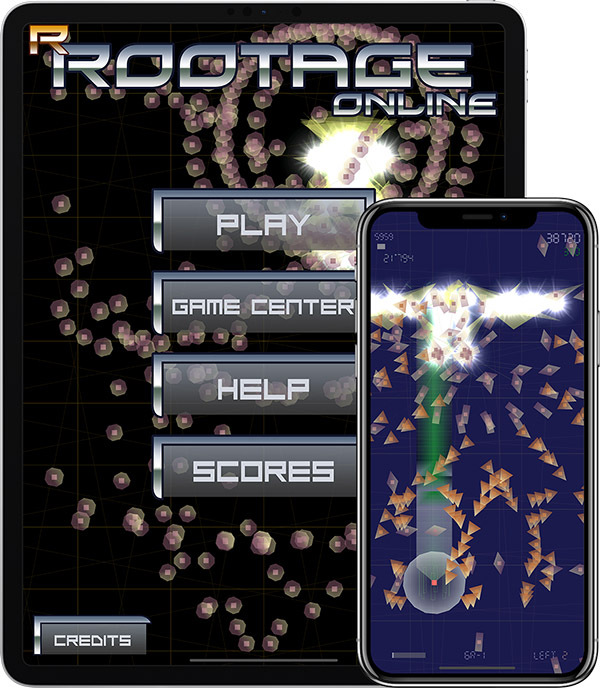 Kenta Cho's legendary shooter rRootage ported and optimized for iPhone, iPad and iPod touch! EUROGAMER (Rating 9/10): "rRootage Online is why Kenta Cho releases his games in the way he does; it's now got a chance to hit a new audience, and be enjoyed by many more people, in what feels like the definitive version." APP SPY (Rating 4/5): "[...] for those who consider themselves fans of the shmup genre, this is without a doubt a must buy." TOUCHARCADE: "Anyone who enjoys a nice 2D shooter should grab this one instantly." POCKETGAMER: "The fact that this gem is available on the App Store is great news." FINGERGAMING:: "rRootage offers much more variety than the typical App Store shoot-’em-up [...]. Shooter fans should definitely check this one out. THEPORTABLEGAMER: "If R-Type was too simple for you, or DoDonPachi Resurrection was something you completed with one eye closed while doing one handed pushups, then this is worthy of your time and money.